One of the benefits of being a research fellow here at Mount Vernon is that at times you are able to be on the estate grounds when permissible by security. The weather forecast for this morning was virtually rain free so I decided last night that today would be a great morning to watch the sunrise from the mansion. I got up at 5:15 AM, contacted security to make sure that it would be OK if I was on the grounds today and then walked over to the estate. 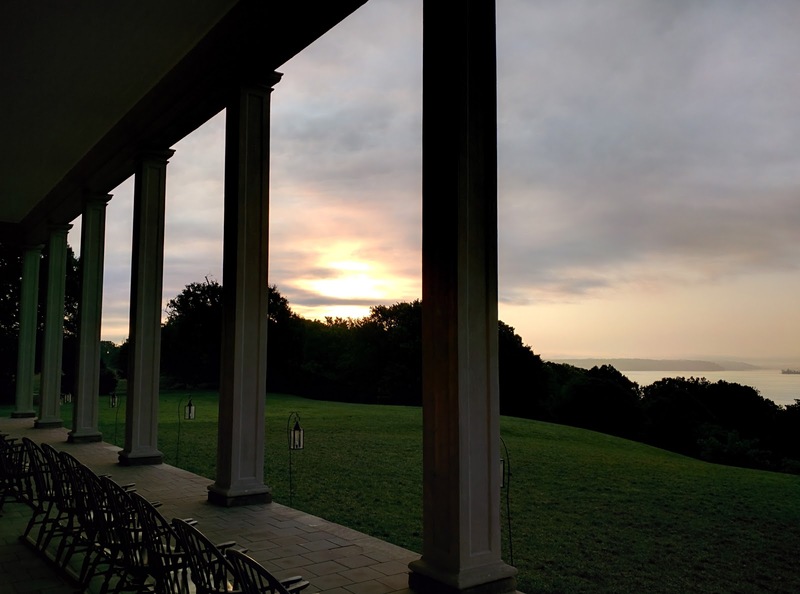 Sometimes when I arrive there are others at the mansion, also wishing to soak in the feeling of experiencing what Washington did in his early morning ritual. This morning there was no one around except for the singing birds providing the soundtrack for this marvelous setting. The sunrise officially took place at around 5:40 AM but it wasn't until closer to 6:00 AM that the sun finally poke through over the trees in the north. I took a short video to capture the sounds of the morning. Sitting on the porch, looking out over the same view that Washington had when he woke up over 200 years ago, is an incredible experience which helps me feel closer to knowing our first President. I have always believed in a strong connection between the physicality of experiencing the surroundings in which a specific time in history takes place. The rest of the day was spent working on the outline of my lesson plan. I am creating a lesson for middle school teachers that provides a foundation in the tools of archaeology and then allows students to investigate history mysteries based upon a variety of archaeological findings at Mount Vernon. This afternoon I had a meeting scheduled with two experts who would be able to provide me feedback on my lesson plan ideas - Eleanor Breen, Deputy Director of Archaeology at Mount Vernon and Esther White, Director of Historic Preservation at Mount Vernon. Both were able to provide me specific feedback on a variety of resources I could implement in my lesson plan and some leads on finding primary resources and examples. They were also excited about my project, which made me feel great about the work I am doing here at Mount Vernon. They also extended an invitation for me to visit the archaeology lab at any time and to feel free to ask any questions. Today was a big step in narrowing the scope of my research to create my lesson plan and I feel good about my progress so far. Tomorrow I head into explore the Library of Congress. I have spent a little time in the Jefferson Building but tomorrow I want to explore the Library of Congress more as a researcher and I have a couple of specific items that I want to try and get pulled.